Woodstock Job Bank: Please Call For Hours-(802) 457-3835. Posted April 12, 2019 by Beth Fish & filed under Uncategorized. Posted March 6, 2019 by Beth Fish & filed under Uncategorized. Please see the link below for the results of the March 6, 2019 vote. Posted November 22, 2016 by Lynn Beach & filed under Uncategorized. Please click here to access the Town and Village Audit Reports. How are the 1% local options tax being managed? Posted October 29, 2015 by admin & filed under Uncategorized. The Woodstock Economic Development Commission, charged with managing the allocation of funds received from the 1% local options tax, has established a decision making process and specific guidelines for awarding grants for Events and Community Projects. 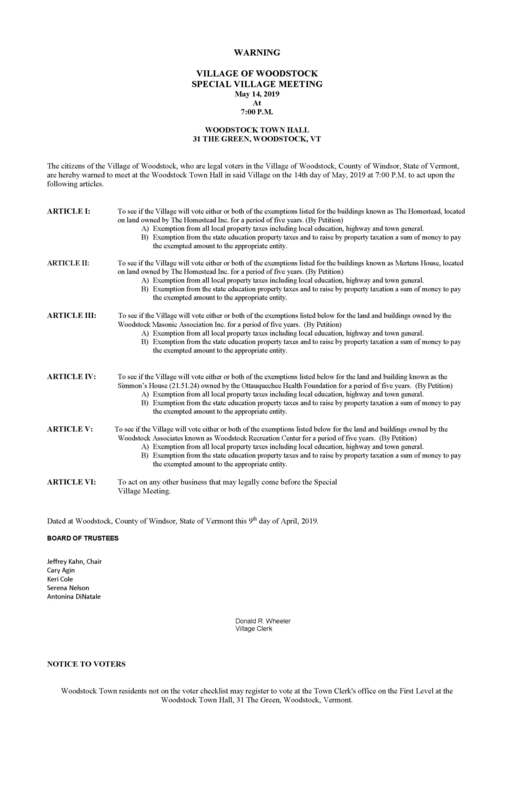 These guidelines reflect the Commission’s interpretation of the article that was adopted at the Woodstock Town Meeting on March 3, 2015 and is subject to the approval of the Woodstock Selectboard. Posted September 11, 2015 by admin & filed under Uncategorized. Town residents who wish to receive emergency notifications, may register here. Posted July 7, 2015 by admin & filed under Uncategorized. Posted June 3, 2015 by Lynn Beach & filed under Uncategorized.